An hour and a half South of Los Angeles, California and half an hour North of Tijuana, Mexico, sits San Diego. Contrasting the kick-back-and-relax attitude of west coast life the natural deep water harbour has made the port a stronghold for the US Navy. At any one time there will be one or two aircraft carriers in the bay, complemented by a selection of frigates, submarines, and a selection of naval aircraft. The birthplace of San Diego is now known as much for its military prowess as its technology and healthcare economies. It’s also a great place to hold a conference. I was there recently as a guest of Satcom Direct (www.satcomdirect.com), which selected San Diego for its annual Connecting With Customers event. The Florida based business is a leading provider of satellite voice and broadband data solutions for flight deck and cabin communications and with a firm focus on customer support, it invited some 300 suppliers and customers along. The event is designed to keep customers fully informed and up to date, and as suppliers to the military, as well as the business aviation fraternity, San Diego was a great location to combine business with pleasure. Day one offered a couple of options to get out on the water with a chance to visit the USS Midway (www.midway.org) an aircraft carrier turned naval aviation museum, or enjoy the excitement of watching whales. Whilst passionate about aviation, I can see aircraft regularly as part of my work. Whales however are a little more elusive, so I chose the Hornblower Cruises trip (www.hornblower.com). Departing from a berth moored just alongside the Midway, Hornblower Cruises offer three and a half hour trips into the bay of San Diego. The general public are often joined on the cruises by natural history experts. Some of them have over 40 years of whale watching experience so they are a great on-board asset for spotting the beasts, because massive though whales are, they are a bit like icebergs, most of the mass remains below water. Spotting them is not an exact science, and it’s not technology led. Whale spotting takes patience, optimism, knowledge and understanding. It’s a collaborative event. Boats will report sightings, captains will share locations and lady luck throws her hand in too. It began to rain as the Hornblower yacht cruised out of the harbour into San Diego Bay. It didn’t seem like a good day to be defining whale spouts from wind blown spray, however pointing the bow towards the sun our captain headed to sunnier territory and within 30 minutes all eyes were scanning a blue-sky horizon. A single sting-ray was spotted in the harbour, then a lone dolphin appeared on our bow, and then just when it seemed like it wasn’t our day for whales the shout of “Port bow, ten o’clock, water spouts” rang out. The three whales, two adults and a juvenile, were happy to demonstrate their magnificence. First they teased us blowing spouts of fine spray about ten feet in the air, then, as they dived a glimpse of their slate grey body was visible at the crests of the waves as the whales arched and reached for deeper water. Holding our breaths we waited another five minutes and again the water-spouts appeared. A little more was revealed as we saw a fin then another fin, it meant they were on their side as Grey Whales don’t have fins on their back, then nothing again. The whales appeared to be teasing us, it was unclear who was watching who. A pause of fifteen minutes, the spray again and then something nobody would have predicted, all three whales appeared to make a headstand, three whale tails hung vertically, about 20 ft in the air, for a minute. Gasps all round as we took in the awesome sight of some of the ocean’s largest creatures revealing their aquatic grace. Then they were gone, and they didn’t come back, perhaps they had been saying goodbye before continuing their journey north. After day two of the meeting the evening event took place at the absolutely fascinating San Diego Air and Space Museum (www.sandiegoairandspace.org). Situated in Balboa Park the rotunda shaped building is divided into many galleries with sections focusing on World Wars I & II, the golden age of flight, and modern jet & space age gallery, amongst others. 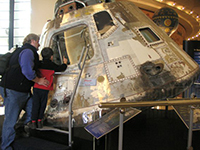 Each of the areas inspires and educates and it is somewhat humbling to stand next to the Apollo 9 landing capsule. Seeing the seemingly fragile unit, barely big enough to fit three people, with re-entry burn marks on the base, showcases the astronaut’s unambiguous bravery. A cabinet next to the capsule displays moon rock, the closest most of us will ever get to our lunar sister. Equally astounding are the selection of lovingly restored aircraft from all different eras. Much of the restoration takes place at the Gillespie Field Annex where volunteers give up their time to restore, or replicate, the passage of aviation history. In the depths of the museum is another work-shop where, by appointment only, tours lead guests around piece-meal restoration projects undertaken by volunteers, mostly ex-service men with aviation in their hearts. It’s testament to the enthusiasm of the volunteers that they will lovingly recreate an aircraft with no more than a single photo for guidance. The list of aircraft is endless and includes everything from a model of the Montgolfier brothers’ hot air balloon through to modern day fighter jets. For those inspired enough to try piloting, the museum has a number of flight simulators including an F35 pod. Climbing into the “cockpit” crew are strapped in tight before being instructed on the mission. A two-minute ride seems like a moment, as the pod simulates full looping, diving and shooting. It’s a great adrenalin rush and leaves a buzz in your head and grin on your face. It also makes you appreciate the skill and dexterity of today’s fighter pilots. Post ride the aircraft around you take on a whole new meaning. 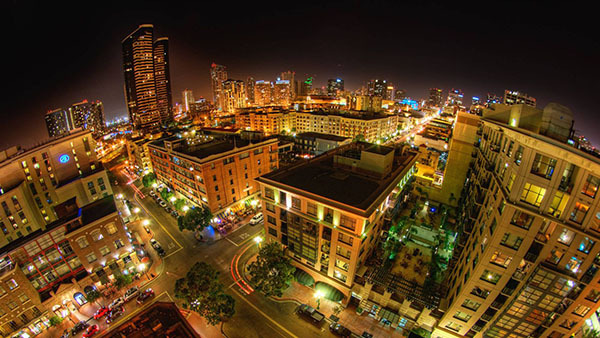 No conference is complete without a night out on the town and in San Diego the Gaslamp district is the place to party. Covering 16 square-blocks the Gaslamp district playground is the heart of downtown (www.gaslamp.org). Over one hundred restaurants, pubs, coffee shops, nightclubs, shops offices and residences are housed in a combination of Victorian style buildings and skyscrapers. In addition for culture vultures there are theatres, art galleries, music venues and museums. Our venue was “The Lucky Bast**d Saloon”, a truer modern, US boys-bar could not be found. Accompanied by Slapbak, a great band, guests dined on classic Tex Mex bar food, sliders, nachos, chicken wings and pizza, accompanied by all types of Mexican influenced cocktail. Tequila featured highly. A number of games including Billiards, Shuffleboard, and Beer Pong; a game involving cups, a Ping-Pong ball and beer, entertained for hours. If you are seeking out a true American experience this is it. As California’s second biggest city San Diego retains charm and a chillaxed outlook, and for those looking to experience the best of West Coast life, it would be hard to beat. Fly with www.Virgin-atlantic.com for competitively priced return flights.